CUNARD, JOSEPH, timber merchant, shipbuilder, and politician; b. 1799 at Halifax, N.S., son of Abraham Cunard, merchant, and Margaret Murphy; m. 12 April 1833 Mary Peters of Bushville, N.B., and they had four sons and one daughter; d. 16 Jan. 1865 at Liverpool, England. After attending the Halifax Grammar School Joseph Cunard entered his father’s firm in that town. About 1820 Joseph and his brother Henry went to Chatham, N.B., on the Miramichi River where they opened a branch of the family company, known as Joseph Cunard and Company; their older brother Samuel was also a partner in the branch. They immediately purchased a wharf and a store and were soon involved in lumbering, milling, and shipping on the south side of the river. In 1832 Joseph Cunard was described as one of the wealthiest and most influential merchants in the province. At Chatham his firm owned several mills, including a large steam mill which began operations in 1836 and sawed 40,000 feet of lumber a day. In the same town the firm also had a brickworks, several stores, a counting house employing 30 people, and at least two shipyards. Mills were constructed farther down river and a store was opened in Shippegan. In 1830 stores were opened at Kouchibouguac and Richibucto in Kent County, and in 1841 William Raymond could report that Cunard had done £100,000 of business with him in Kouchibouguac and that he had paid approximately one third of this sum in ships. Cunard’s operations in Kent County made Richibucto for a short time the third largest shipping port in New Brunswick. In 1831 the company purchased stores, houses, and other buildings at Bathurst and the next year began shipping timber. Exports of lumber from Bathurst rose from 1,300 tons in 1829 to 26,500 tons in 1833. Cunard’s shipbuilding activities were extensive. A number of vessels were built for him in the years 1827–38, but by 1839 he had two shipyards of his own in Chatham. There he had at least 43 vessels built, including the Velocity, the first steamboat constructed on the Miramichi, which was launched in 1846. Cunard began building ships at Bathurst in 1839 and from 1841 to 1847 was the only shipbuilder in the area. Between 1839 and 1847 he built at least 24 vessels at Bathurst. At his shipyards at Richibucto and Kouchibouguac, which began operations around 1840, he had at least nine vessels constructed in the years 1840–47. By 1841 Joseph’s brothers were no longer active in the Miramichi firm and he was given a free hand in it, although Samuel continued as a partner until 1846 and continued to advise his brother on his various entrepreneurial schemes. Cunard made Chatham his headquarters and was active in local affairs and politics. He was a justice of the peace, member and chairman of the Board of Health for Northumberland and Gloucester counties, and commissioner of lighthouses. In 1828 he became an mha for Northumberland County, retaining his seat until his appointment to the Legislative Council in 1833. From 1838 until his resignation in 1846 he was also a member of the Executive Council, though he was not an influential figure in that body and was rarely involved in any controversy. 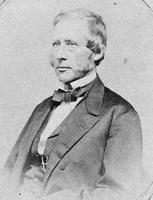 As chairman of the Board of Health, Cunard was involved in the establishment of a lazaret on Sheldrake Island in 1844 [see François-Xavier-Stanislas Lafrance]. Four years later he joined the other members of the Board of Health and the lepers living on that island in opposing the desire of the local magistrate to move the quarantine station for arriving immigrants from Middle Island, which Cunard owned, to Sheldrake Island. The buildings were, nonetheless, moved in 1848, but later that year the government decided to move the quarantine station to Chatham. In 1839 Joseph Cunard accompanied his brother Samuel to England, where Samuel obtained a contract to carry the transatlantic mail by steamship. Although there is no evidence to show that Joseph played any part in these negotiations, he was given a triumphal reception on his return to Chatham. It was not yet realized that the development of steam power would mean the end of wooden ships and the end of the prosperity of the Miramichi area. Cunard had many enemies as well as admirers. Upon his first arrival in Chatham, he had entered into bitter rivalry with the firm of Gilmour, Rankin, and Company, which was already firmly established in the Miramichi area. One of the earliest disputes between the two firms was over large timber reserves on the northwest Miramichi and the Nepisiguit rivers. As part of Thomas Baillie’s plans for development of the timber industry, Cunard had been granted over 500 square miles of these excellent reserves in 1830–32 on condition that he improve the streams by erecting sluices and clearing obstacles. No other firm was interested in this area until Cunard proved that operations there could be profitable. When Cunard failed to carry out the promised improvements, Alexander Rankin* led an attack on his privileges. In 1833, on instructions from the Colonial Office, Cunard was forced to relinquish the reserves. This was the first battle he lost to the Rankin firm. The quarrels continued over ownership of timber, trespass on mill reserves, and the election of candidates to the assembly. The rivalry was particularly bitter in the “fighting elections” of 1842–43 in Northumberland County, when Cunard supported John Thomas Williston and Rankin backed John Ambrose Street. Crowds of 500–1,000 men fought during these election campaigns and troops were eventually sent to restore order. Street’s election was another defeat for Cunard. Cunard’s recklessness and his overextension of his resources caused him continual trouble. In 1842 the Cunards faced bankruptcy. At the same time, the provincial government took action against Joseph Cunard to force him to settle his accounts with the government. The Executive Council appointed a committee to investigate his debts; it recommended that Cunard post bonds of £3,000 and that his timber, which had been seized earlier, be released. It also recommended an investigation into the conduct of the deputy surveyor in the area, Michael Carruthers, some of whose actions seemed designed to damage Cunard’s business to the advantage of Gilmour, Rankin, and Company. Carruthers was later transferred out of the county. Cunard managed to survive the difficulties but by 1847 was unable to meet his obligations. Depressed economic conditions, strong competition from Gilmour, Rankin, and Company, and reckless expansion of his enterprises all played a part in his downfall. In November 1847 he declared bankruptcy. A panic ensued in Chatham where hundreds of men depended on him for work. An angry crowd confronted him in the streets with cries of “Shoot Cunard,” but with two pistols in his boots Cunard stood his ground and is supposed to have demanded, “Now show me the man who will shoot Cunard.” The crowd then dispersed. According to the newspapers, between 500 and 1,000 people were out of work as a result of Cunard’s failure and many left the area in search of employment elsewhere. A number of small firms in the area also went bankrupt. The timber trade of the Miramichi area was depressed for many years partly as a result of Cunard’s failure, but shipbuilding revived and boomed in the 1850s. In 1849 Cunard left New Brunswick but returned shortly in an unsuccessful attempt to settle his affairs. His debts were not finally cleared up until 1871 and Samuel Cunard apparently assumed most of the burden of his brother’s failure. Joseph finally left Chatham in 1850 and moved to Liverpool, England, where he entered the ship commission business as a partner in the firm of Cunard, Munn, and Company. In 1855 he formed a new company, Cunard, Brett, and Austin, which became Cunard, Wilson, and Company in 1857. These firms, working on a commission basis for colonial merchants and lumbermen, sold ships and lumber and purchased goods. The latter firm was still in operation at the time of Joseph’s death in 1865. Cunard was a colourful individual who played a major role in the commercial activities of Northumberland, Restigouche, Kent, and Gloucester counties. His failure in the late 1840s was to affect the economy of the area seriously for many years. Mariners’ Museum (Newport News, Va.), Indenture between Samuel, Joseph, and Edward Cunard, and Charles Walton, William George Driscoll, and Robert Carter, 11 April 1842 (photocopy in N.B. Museum). N.B. Museum, “One of the noted sons of Kent Co., N.B. : Honourable Joseph Cunard, industrialist and member of Legislative Council” (typescript); Webster coll., Sir Howard Douglas, letterbook (typescript), p.221. PANB, Cunard-Raymond letterbooks and diary, 1840–53 (mfm. ); J. C. and H. B. Graves, “New Brunswick political biography,” XI, pp. 24–25; Samuel Merchandising family papers, M. Samuel to Messrs Moses, Son, and Davis, 26 March 1842; REX/le/l–g, Head, letterbook, 1848–50, p.153; REX/pa/Register of appointments and commissions, 1785–1840, pp.31, 48, 99, 101, 140–41; REX/pa/Surveyor general’s correspondence, 1843, I(a), 3; II(a), 2; REX/px, 20, pp.1886–91; 24, files 5–6; 65; 116, file 2; RLE/S55/pe/202; RLE/S63/pe/218; RNA/c/9/3/22; RPS, Letterbook, 1842–45, pp.15, 25; 1845–47, pp.214, 225, 341, 367; 1847–50, pp.135, 163, 201–2, 209–10, 227–28, 253. PRO, CO 188/42, 30 Nov. 1831; 188/43, 16 Jan. 1832; 188/46, 14 Oct. 1833; 188/99, 26 Feb. 1847; 188/106, 23 Oct. 1848; 188/108, 20 Feb. 1846, 29 March 1849. Gleaner (Chatham, N.B. ), 13 Aug. 1833; 8 Dec. 1835; 16 Feb., 12 July, 4 Oct. 1836; 30 April, 7 May 1839; 6 June 1846; 15 Feb. 1848; 29 June 1850; 27 Jan. 1851; 17 Nov. 1855; 21 Jan., 4, 11 Feb. 1865. Miramichi Advance (Chatham, N.B. ), 10 June 1880. Esther Clark Wright, The Miramichi: a study of the New Brunswick river and of the people who settled along it (Sackville, N.B., 1944), 44–51. Hannay, History of N.B., II, 19. MacNutt, New Brunswick, 216, 230, 240, 275–76, 288, 321. Louise Manny, Shipbuilding in Bathurst (Fredericton, 1965), 3–7; Ships of Miramichi: a history of shipbuilding on the Miramichi River, New Brunswick, Canada, 1773–1919 (Saint John, N.B., 1961), 24–33; “Colossus of Miramichi,” Atlantic Advocate (Fredericton), 55 (1964–65), no.3, 37–41. W. A. Spray, “CUNARD, JOSEPH,” in Dictionary of Canadian Biography, vol. 9, University of Toronto/Université Laval, 2003–, accessed April 22, 2019, http://www.biographi.ca/en/bio/cunard_joseph_9E.html.